How much electricity do you use? How can you lower yourelectricity bill? Which of your appliances use the most energy? What are good energy habits? When you respond to the online Home Diagnostic questionnaire, you’ll get answers to all these questions, thanks to a personalized energy evaluation of your home and practical recommendations on reducing your electricity consumption. The free Home Diagnostic, developed for customers in conjunction with Hydro-Québec’s energy technology laboratory (part of its research institute), has been completed more than 1.3 million times since 2003. The Home Diagnostic is available in your secure, personalized Customer Space, which is your dashboard: All the information about your accounts is there in one place. It’s the starting point for the Personal Online Services Hydro-Québec offers to simplify your life. How does the Home Diagnostic work? You answer a series of 43 to 127 questions, depending on your situation. The questionnaire is very detailed to make the results as accurate as possible. It’s designed to cover all household uses of electricity, from home heating to filtering the swimming pool. Your answers are processed confidentially by software that also takes into account your actual electricity consumption for the past year, then gives you a personalized report with recommendations on how to save energy. 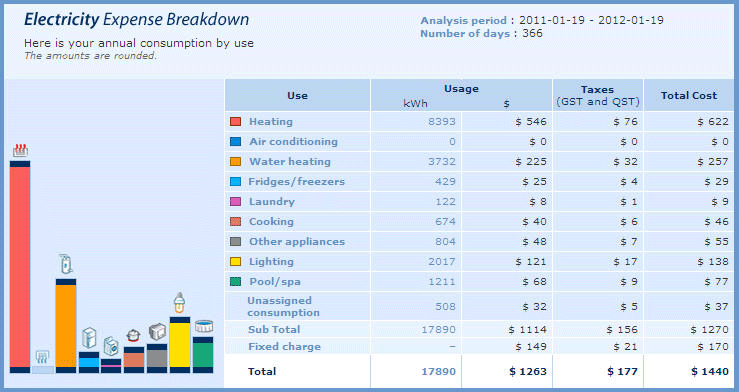 As can been seen in the following example, knowing how different activities affect your energy bill can help you make more informed choices and reduce your energy consumption. Who can do the Home Diagnostic? If you’re a residential customer, you can do the Home Diagnostic, no matter whether you’re a homeowner or a tenant. You can analyze your principal residence, secondary residence or cottage. But some conditions must be met. The electricity bill must be in your name and your consumption history has to be of at least 350 days, including five billing periods with actual meter readings. The report you receive will suggest things to do or buy and provide tips for your retrofit projects. For some recommendations, you’ll get an estimate of how much electricity and money you could save if you changed certain habits or purchased energy-efficient appliances. You’ll even find out how long it would take to recoup your investment. The diagnostic will let you know just how energy-efficient you are. In addition, it can simulate the impact of changes you are considering to make your house more energy-efficient.